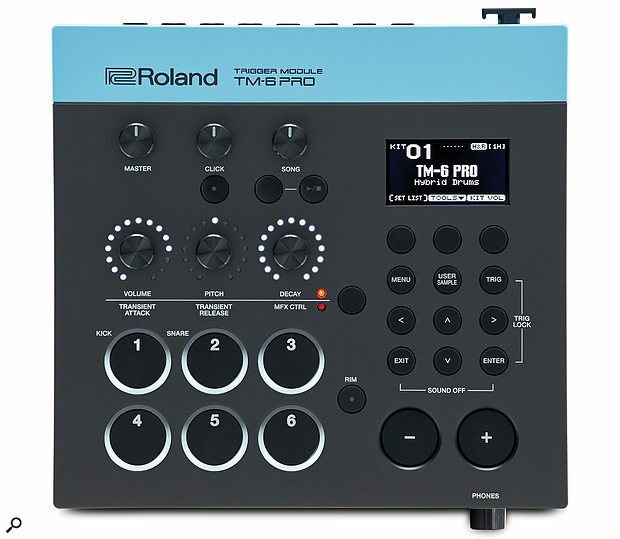 Roland’s TM‑6 Pro module could be the perfect way to combine electronic and acoustic drums. Until the early 1980s, drumming had remained the last bastion of acoustic performance in a typical pop or rock band. Bassists, guitarists and, of course, keyboard players had long since moved into the area of electronics, whether for amplification or augmentation of their sound. Then, in 1981, Simmons changed the face of drumming with the introduction of the first electronic drum kit. Although not quite representative of the ‘true’ sound of a drum kit, the first electronic kits introduced a weird, quirky and futuristic sound to the drummer’s palette, very much in keeping with the music of the time. As the decades passed, industry big hitters such as Roland, Yamaha, Alesis and many more joined the electronic drum revolution, and electronics are now a familiar part of the drummer’s arsenal. In fact, the ability to integrate samples and loops has become almost essential in order to replicate complex album productions in a live performance scenario. This ‘hybrid’ model of acoustic and electronic sounds has not only increased in popularity but also complexity. The need to integrate samples, loops, click tracks and effects can seem like a complex technological minefield — and also potentially expensive. Devices such as the Roland SPD‑SX sought to make things a little easier with their ‘all in one’ pads and sampler design, but now a new generation of hybrid modules seeks to take things a stage further by adding even more features to assist, inspire and simplify the whole process of integrating live drums with electronic sounds. The TM‑6 Pro Trigger Module is the latest release from Roland in their line of Hybrid drum products. It’s the big brother to the TM‑2 and is essentially the ‘brain’ element of a Roland electronic kit. It features six dual‑trigger inputs and 500 brand‑new drum and percussion sounds recorded at world‑renowned studios such as Real World and Rockfield. In addition to using the provided sounds, you can also import your own samples and backing tracks via SD card. All well and good — but what makes the TM‑6 Pro more than just the business end of a standard electronic drum kit? The device itself has a very clean and simple look — it’s a basic square box without the usual stylistic design flourishes of many drum modules. The top inch or so of the case is a light blue, with the rest of the case the more typical matte black. Many of the knobs and buttons are backlit to stand out clearly, ideal for live playing. The three knobs across the top of the unit provide control of the Master, Click and Song volumes respectively. A further three knobs immediately below allow for quick access to sound editing parameters such as volume, pitch, decay and transients. LEDs surrounding the knobs offer instant feedback on their current levels. A large LCD to the right sits above three soft buttons giving access to additional editing parameters, with dedicated Menu, User Sample and Trigger buttons below. The usual left/right/up/down buttons are provided for navigation around the display, and there are two large + /‑ buttons for data entry. Again, the large buttons are handy for live use. The rear panel houses the trigger input, sound output and control jack sockets, of which there are many. The six trigger input jacks are all dual input, which means that they can either be connected to a source that offers dual‑zone triggering (typically head or rim) or, with the addition of a ‘Y’ splitter cable, can be connected to two ‘single’ triggers. You can configure the six triggers in any combination, but potentially you could connect up to 12 individual triggers or pads to the TM‑6 Pro. The TM‑6’s rear‑panel connections are all on quarter‑inch jacks and include six trigger inputs, footswitch and hi‑hat control inputs, four direct audio outputs, a stereo master output and a headphone socket. If you were looking for a reason to buy the TM‑6 Pro over something like an SPD‑SX, the inclusion of a hi‑hat control input might be the deciding factor. While you can happily play hi‑hat samples from an SPD‑SX, it has no control pedal input, whereas the TM‑6 Pro allows you to plug in a compatible hi‑hat controller and achieve open and closed hi‑hats. In addition to the master L‑R output jacks, a further four direct outs are included, for a total of eight discrete outputs (including the headphones). This is a great feature for both live and studio use, enabling external processing of the individual sounds within the TM‑6 Pro. Completing the rear panel are a headphone socket, footswitch jack, PSU socket and on/off switch. The MIDI output, USB socket and SD card slot are housed in a neat recess on the right‑hand edge of the unit. Considering how solid it looks, this box is surprisingly light. In terms of physical features, the only downside I can see is that you’ll need to purchase something called an APC‑33 if you want to mount the TM‑6 Pro on a stand, as a stand‑mounting facility isn’t provided as standard. The TM‑6 pro ships with 80 preset kits and a further 20 internal user locations to store kits. Each kit comprises six ‘Instruments’, which are the sounds you hear when you strike a connected pad or press one of the trigger buttons. Each instrument is made up in turn of up to two sample waveforms, A and B, that can be layered together. Roland have made quite a big deal out of the fact that the 500 sounds in the TM‑6 Pro are all new and not recycled from existing modules. In fact, all the sounds have been specially recorded by the likes of Michael Shack, Kaz Rodriguez and Chris Whitten, using a host of classic and vintage drums, at Real World and Rockfield studios. As you might expect with a module aimed at augmenting an acoustic set up, there are also a large number of newly created electronic sounds in the TM‑6 Pro. The preset kits are always a good starting point so, with a trigger attached to the kick and snare of my acoustic kit, plus a couple of additional pads, I checked them out. As you’d expect from a company with Roland’s pedigree in the world of electronic percussion, the TM‑6 Pro sounds excellent. There are plenty of kits such as ‘Hybrid Funk’, ‘Hi Metal’, ‘Rock’, ‘Rezo Funk’ and ‘Acoustic’ that are ideal for adding ‘natural’ drum sounds to your kit but, for me, the TM‑6 Pro comes into its own with kits like ‘LoFiBoomBox’, ‘Bit Kick’, ‘Trap’, ‘Hip Hop’ and ‘Electro R&B’, which introduce a range of electronic sounds that are both fun and inspirational. Having a deep, low sub booming when you play your bass drum along with a tight hip hop‑style snare, or earsplitting, reverb‑drenched clap on a pad, gives a whole new dimension to your playing. Should the preset kits not give you exactly what you need, the three knobs across the centre of the TM‑6 allow quick and easy ‘on the fly’ editing of each instrument. Six parameters are available in two groups of three, with a button to switch between Volume/Pitch/Decay and Transient Attack/Transient Release/MFX control. The first three parameters are fairly self explanatory and offer the usual Roland extremes in terms of how much you can modify a sound. The Pitch parameter has values between ±2400, which I believe equates to four octaves and will take a bass drum from ‘subsonic’ to ‘cowbell’. The Decay parameters are equally extreme, giving an incredible level of control and allowing you to change a sound quickly and dramatically. The second group of parameters is a little more subtle and lends itself more to integrating TM‑6 Pro sounds with an acoustic kit. Transient Attack and Release introduce more or less of the transient element of the Instrument; the ‘A’ and ‘R’ parts of an ADSR. Imagine you’re layering an electronic sample from the TM‑6 Pro on top of your acoustic snare: you can back off the amount of Transient Attack in the sample so that the acoustic snare is providing the initial ‘hit’ element of the sound and the sample is giving the ‘back end’. Conversely, you may want to reduce Transient Release to allow the attack of a bass drum sample to give a bite to your acoustic kick without adding to the overall sound of the drum. In addition to a global multi‑effects processor that affects the whole kit, featuring a master reverb, compressor and EQ, each of the six triggered instruments can be assigned its own effect, and these range from flangers and phasers through to tape echoes, bit crunchers, reverbs and filters. The MFX knob controls a predefined parameter (or parameters) of the selected effect; for example reverb time, filter cutoff, delay time or, in the case of the bit crusher, a combination of the sample rate and the filter. As a final note, editing using the three parameter knobs adjusts the levels for both A and B elements of an instrument simultaneously. You can edit instruments A and B individually by holding down the Enter button as you turn any of the parameter knobs. If you need more detailed control, each instrument can be edited by going directly into the Instrument Edit page, where you can change individual samples themselves, as well as their volume, pan, pitch, decay and sweep. As I mentioned earlier, each instrument in a kit comprises up to two of the 500 samples in the TM‑6, layered together. Selecting the Menu button and Instrument option on the LCD takes you to a screen where you can select the samples, which are grouped into categories — Kick, Snare, Cross Stick, Clap, Tom, Hi Hat, Ride, Crash, Percussion and Elements — making the selection process quicker and easier. The final category you can select from is User Sample. In this category you can choose any sample you’ve imported into the TM‑6 via the SD card. Samples must be in WAV format at 44.1KHz, 16‑/24‑bit and not exceeding 180 seconds each, which is more than enough time for a drum hit or even a vocal phrase or bass line. The TM‑6 can store up to 48 mono (or 24 stereo) minutes of user samples in 1000 user locations. I’d say that’s plenty of space! The import process is very simple and within a few seconds I had loaded in drum samples from a project in my DAW, assigned them to the TM‑6 pads and added effects. This makes taking specific samples from a studio project to a live scenario a simple and painless process. Modern drumming not only entails integrating electronic sounds with your acoustic kit — it can often mean playing along with backing tracks or click tracks. Again, this can be technically challenging and expensive, but the TM‑6 Pro has it covered. Playing with just a click is very simple to set up: press the button below the click volume knob and the LCD screen instantly changes to show the current tempo. You can save a tempo with each kit, so the display will update to show the currently selected kit tempo. Press the soft ‘On’ button below the LCD and the click is sent by default to only the headphone output. Via the Settings option you can set a time signature, click sound and volume, as well as selecting a pad or footswitch as a tap‑tempo source. In addition to importing your own samples via the SD card, you can also import complete backing tracks. To be completely accurate, import is the wrong term, because the TM‑6 Pro actually plays back the backing tracks directly from the SD card rather than using up any internal memory. Simply copy a WAV file of your backing track to the SD card and, with the card inserted in the TM‑6 Pro, press the Song button and the first WAV (sorted alphabetically on the top level of the SD card) is instantly available to play. Soft keys below the display allow you to scroll through the songs in order, or you can delve into folders and sub‑folders created on the card, should you need to organise things a little more. Here’s a neat trick with the click track: in addition to creating a WAV file backing track, create an additional WAV file that contains only the click track. Give it the same name as the backing track file (but add ‘_click’) and copy both to the same root directory on the SD card. Now, when you select a song its click track will play along. As it is a discrete file, you can control the volume and output routing of the click independently from the backing track, using the Click and Song volume knobs. Genius! Another great feature that enhances the TM‑6 as a live performance tool is the Set List feature. Here you can set up 32 kits in the order you would use them in a live performance and scroll through them in order using the +/‑ buttons or a footswitch. I’m a huge fan of integrating electronic sounds with acoustic, and the TM‑6 makes the process both simple and fun. The triggering is fast and accurate, whether you’re using a drum pad or a trigger on an acoustic drum, and the hi‑hat pedal input makes it possible to fully integrate electronic hi‑hats into an acoustic setup. I’ve yet to review a Roland kit that didn’t have an incredible set of internal sounds and the TM‑6, with its all‑new samples, is no exception. The kits are inspirational to play along with on your acoustic drums, and the ability to quickly edit an instrument on the fly makes the TM‑6 a very flexible and usable device. Add to that the ability to import your own samples and there is literally no end to what the TM‑6 Pro can offer in terms of sounds. In addition, it really lends itself to live performance with useful features such as the direct outputs, the ability to import discrete click tracks to play along with backing tracks, set‑list management and big, bold, backlit buttons and displays. 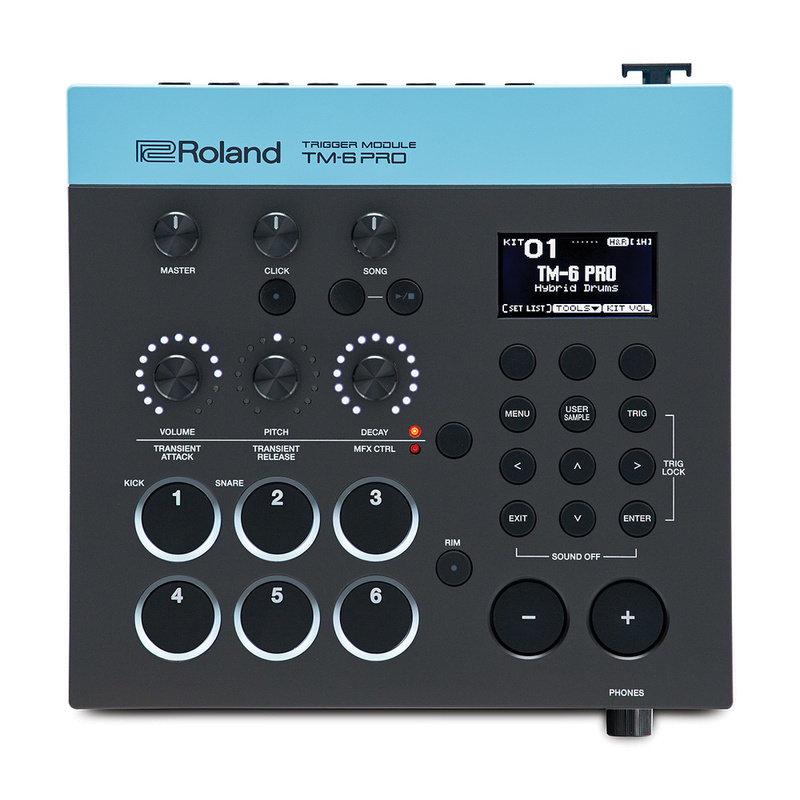 You can certainly acquire elements of the TM‑6 in a number of current Roland products, with the SPD‑SX probably coming closest, but to get the complete range of features and sophistication the TM‑6 Pro offers, you’d otherwise need to invest in Roland’s top of the range TD‑50V module, which weighs in at around £1800$2400. This makes the TM‑6 Pro’s price tag of £769$800 look pretty attractive. In short, if you’re looking to integrate electronics into your acoustic setup, either with samples, triggers, pads or backing tracks, the TM‑6 is a fantastic way to do it simply, efficiently and relatively inexpensively, with the bonus of a great deal of future proofing and flexibility. A USB socket, MIDI out and SD card slot are found on the right‑hand side of the unit. A USB socket is almost de rigeur on audio equipment these days and the TM6 doesn’t disappoint in this department, enabling multi‑channel integration with a Mac or PC. With the Roland driver installed, the TM‑6 Pro publishes the audio (at 44.1, 48 or 96 kHz) routed to the individual direct outputs, master outputs and headphone outs as discrete inputs to your DAW, giving a potential eight individual channels. In conjunction with the MIDI output of the TM6, you can record a multi‑channel performance live into your DAW and edit or replace any of the drum sounds or parts easily. In terms of playback, all eight potential outputs of the TM6 are available as discrete outs from your DAW — phones L‑R, main L‑R, and direct outs 1 to 4. So essentially what you have is an eight‑output audio interface built in! Click track and backing track management. Doesn’t ship with a mounting option. The TM‑6 Pro takes the concept of the hybrid drum kit and turbo charges it with great sounds and well thought‑out features like backing track/click playback, all in a single, easy to use unit.